At South Station, Boston, homicide detective Thomas Craven picks up his daughter Emma, who comes home to visit and vomits while getting into the car. As Craven prepares dinner at home, Emma suffers a nosebleed and vomits again. As the two exit the house on their way to the hospital, a masked gunman yells "Craven! ", fatally wounds Emma with a shotgun (she was the first out the door), and escapes as Craven attends to his daughter. At the medical examiner's office, Craven takes a lock of Emma's hair as a memento, then returns to duty to help find who wanted to kill him. When he finds Emma had a .45 pistol in her night stand, he starts to suspect that Emma was the target. He checks the gun's ownership and finds that it belongs to her boyfriend, David. David is living in fear of Northmoor, the company where he and Emma worked. David won’t say more, but Craven incidentally discovers that the lock of Emma’s hair is radioactive. Emma had discovered that Northmoor, a research and development facility under contract to the U.S. government headed by Jack Bennett, was secretly manufacturing nuclear weapons using foreign material. The weapons were intended to be traced to foreign nations if they were used as dirty bombs. Burning Emma's clothing in his backyard, Craven encounters Jedburgh, a British "consultant" tasked with preventing the disclosure of Emma's information, dealing with Craven however he sees fit. Jedburgh takes a liking to Craven, leaving him to investigate. Craven repeatedly has visions of Emma, including short conversations, typically as the happy young child he remembers and loves. Craven eventually discovers through one of Emma's activist friends, who is nearly killed by a Northmoor agent, that Bennett ordered Emma's murder, as well as those of the other activists Emma was working with to expose Northmoor. Craven confronts U.S. Senator Jim Pine who was contacted earlier by Emma, revealing that Craven knows almost everything that happened. After examining Emma’s fridge with a Geiger counter, Craven discovers that her milk is radioactive. His fellow detective and friend, Bill, comes to Craven's home while the Northmoor agents break into the house. Craven realizes that Bill set him up before the agents taser and kidnap Craven, taking him away in an ambulance. He wakes up handcuffed to a gurney in the Northmoor facility, but manages to escape. His health deteriorating rapidly from radiation poisoning of indeterminate origin, Craven heads to Bennett's house and kills the Northmoor agents after forcing one of them at gunpoint to scream the name "Craven," finally identifying him as Emma's killer. After executing his daughter's killer, Bennett shoots and wounds Craven, but Craven also wounds Bennett, and forces some of the radioactive milk down Bennett's throat. Bennett attempts to take some pills to counteract the radioactivity, but Craven shoots him dead. Jedburgh, who is suffering from an unrelated terminal illness, meets with the Senator and two political advisers who had hired Jedburgh to handle Craven. They want to spin the Northmoor incident in a positive light. Jedburgh suggests that an assassination attempt on the Senator could be an angle to drive Bennett's death out of the headlines. They are pleased with this idea until Jedburgh abruptly kills both advisers and the senator. When a young police officer nervously enters the Senator's room, Jedburgh asks the officer at gunpoint if he has children. When the officer replies yes, Jedburgh lowers his gun, allowing the officer to shoot him dead. While Craven lies dying in the hospital from his wounds and radiation poisoning, a young reporter for the local TV station WFXT, who had spoken to Craven a few nights earlier, opens a letter from him which contains DVDs recorded by Emma revealing the conspiracy, ensuring Northmoor's end. As Craven dies, the spirit of Emma comforts him. Craven and Emma are then shown leaving the hospital together, walking down the corridor and toward a bright, white light. Mel Gibson as Thomas "Tom" Craven, a homicide detective of the Boston Police Department. Gibson is a fan of the television series, and the film marks his first starring role since 2002's We Were Soldiers and Signs, following time spent focusing on directing (The Passion of the Christ, Apocalypto) and an involuntary hiatus following a controversial 2006 alcohol fueled incident. Gibson attended a gun club with two policemen to improve his marksmanship for the film. Ray Winstone as Darius Jedburgh, an operative sent to cover up the murder. Robert De Niro had been cast in the role, but he walked out shortly after he arrived to begin shooting. A publicist for the actor cited "creative differences." Danny Huston as John "Jack" Bennett, Northmoor's shady head. Bojana Novakovic as Emma Charlotte Craven, Thomas' murdered daughter. Shawn Roberts as David Burnham, Emma's boyfriend. Jay O. Sanders as Bill Whitehouse, Thomas' partner and close friend. Gbenga Akinnagbe as Darcy Jones, a detective in Thomas' squad. Frank Grillo as Agent One, Emma's killer. Frank L. Ridley as Automatic Weapons Cop. In 2002, Martin Campbell announced that he was planning to adapt Edge of Darkness for the cinema. Active development began in early 2007 when Campbell met with producer Graham King, who first enlisted Australian playwright Andrew Bovell to write, and then William Monahan (fresh from winning an Academy Award for King's The Departed) to re-write the screenplay. Michael Wearing and BBC Films also co-produced the film. Filming began on 18 August 2008 in Boston, Massachusetts. A scene where Craven scatters his daughter's ashes at a beach was filmed at Rockport on 25 and 26 September. They shot some scenes in Merrimac, Massachusetts from 15 September 2008 to 18 September 2008. Additional scenes were shot in Malden, Massachusetts in the old Malden hospital. Some of the final scenes were shot at a home in Manchester-by-the-Sea, Massachusetts. Additionally, Gibson and his crew set up shop for filming in western Massachusetts, with 180 staff staying in Northampton hotels. They shot in various locations in the Pioneer Valley, including Tully O'Reilly's Pub, the Northampton Athletic Club, and an older part of the Hampshire County Courthouse, all in Northampton. Also, Sugarloaf Mountain was shut down for a few days while they rented it out. They also filmed at the Notch Visitor Center, Rt. 116, Amherst. The film takes place in America, unlike the television series, which was based in England. "The idea was to transfer the story to a different time and place rather than just repeat what we did in England," Campbell said. "Boston seemed like the perfect location because it does have a whole English, Irish signature on it." Jack Bennett disembarks from a helicopter in one scene. The FAA registration number, N401LH, is visible on the fuselage. This helicopter later collided with a Piper PA-32 on 8 August 2009, over the Hudson River, resulting in nine deaths. The helicopter was owned by Liberty Helicopters, which offers sight-seeing tours around Manhattan. The film was originally scored by classical composer John Corigliano. However, the decision was made during postproduction (after Corigliano's score had been recorded and dubbed) to replace his score with a new one by Howard Shore. On aggregate reviewer Rotten Tomatoes, the film has an approval rating of 56% based on 203 reviews; the average rating is 5.3/10. The site's critical consensus reads, "For better and for worse, Edge of Darkness offers vintage Mel Gibson, working within the familiar framework of a bloody revenge thriller." On review aggretator, Metacritic, which assigns a weighted average score out of 1–100 reviews from film critics, has a rating score of 55 out of 100, based on 34 critics, indicating "generally mixed or average reviews". Film critic Richard Roeper of Richard Roeper & the Movies gave the film a B stating: "Gibson excels in this entertaining conspiracy thriller" in his review for the film. Michael Rechtshaffen, a critic for The Hollywood Reporter, wrote in his review, "An intense Mel Gibson performance anchors this brutally effective crime thriller". Some critics, such as A.O. Scott of The New York Times, saw a similarity to Taken. Other critics, such as Chicago Sun-Times film critic Roger Ebert, Chicago Tribune film critic Michael Phillips, and New Orleans Times-Picayune film critic Mike Scott, described Ray Winstone's character in the film as "intriguing". On its first weekend, the film opened number two, grossing $17.1 million behind Avatar. The film went on to gross $43.3 million in the United States and Canada and $37.8 million in other countries for a worldwide total of $81.1 million, against a production budget of $80 million. The film was released by Warner Home Video on 11 May 2010, on DVD and Blu-ray. On October 02, 2018 the was re-released by Warner Archive Collection, on DVD. ^ a b c d "Edge of Darkness (2010)". Box Office Mojo. IMDb. ^ a b Michael Fleming (1 August 2008). "De Niro to join Mel Gibson on 'Edge'". Variety. Retrieved 2 August 2008. ^ a b Michael Fleming (28 April 2008). "Mel Gibson returns for 'Darkness'". Variety. Retrieved 29 April 2008. ^ a b "We hear: Mel Gibson, Jason Varitek, Chaka Kahn". Boston Herald. 20 August 2008. Archived from the original on 10 September 2012. Retrieved 20 August 2008. ^ Michael Fleming (12 September 2008). "Winstone replaces De Niro in 'Edge'". Variety. Retrieved 12 September 2008. ^ a b c d e Borys Kit (14 August 2008). "Three join Mel Gibson's 'Edge of Darkness'". The Hollywood Reporter. Archived from the original on 22 August 2008. Retrieved 15 August 2008. ^ Michael Fleming (4 September 2008). "De Niro exits 'Edge of Darkness'". Variety. Retrieved 4 September 2008. ^ "Maria Gabrielle Popa". The New York Times. ^ "Edge of Darkness 'set for big screen'". BBC News. 16 January 2002. Retrieved 9 April 2007. ^ Jonathan L'Ecuyer (24 August 2008). "Mel Gibson will film scene in Rockport". Gloucester Daily Times. Archived from the original on 24 January 2013. Retrieved 26 August 2008. ^ "Edge of Darkness: Martin Campbell interview". BBC Film Network. 26 January 2010. Retrieved 26 January 2010. ^ McFadden, Robert D. (8 August 2009). "Tourist Helicopter and Small Plane Collide Over Hudson River - NYTimes.com". The New York Times. Retrieved 24 June 2012. ^ "Edge of Darkness Movie Reviews, Pictures". Rotten Tomatoes. Flixster. Retrieved 3 February 2010. ^ "Edge of Darkness: Reviews". Metacritic. CBS Interactive. Retrieved 3 February 2010. 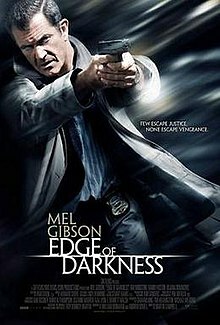 ^ "Edge of Darkness Review". Richard Roeper.com. Retrieved 29 January 2010. ^ Rechtshaffen, Michael. "Edge of Darkness Film Review". The Hollywood Reporter. Retrieved 24 January 2010. ^ Scott, A.O. (29 January 2010). "Movie Review – Edge of Darkness – Jaw-Breaking Boston Detective Unravels His Daughter's Murder". The New York Times. Retrieved 29 January 2010. Mr. Gibson brought a wild, unpredictable streak to his action-hero persona. He traded that in at some point for the haggard, humorless demeanor he shows here, cracking the occasional somber joke on his way to breaking another jaw. Liam Neeson did this kind of parental rage much better in 2008 in Taken, which was an unusually lively and persuasive example of the genre. ^ Ebert, Roger (27 January 2010). "Edge of Darkness". Chicago Sun-Times. Sun-Times Media Group. Retrieved 30 January 2010. He's joined in this by the superb British actor Ray Winstone, as an intriguing free agent who turns up in Craven's garden one night with a cigar and an enigmatic line of patter. ^ Scott, Mike (29 January 2010). "Mel Gibson returns in 'Edge of Darkness' – and it's the same old Mel". New Orleans Times-Picayune. Retrieved 30 January 2010. British actor Ray Winstone ("The Departed", " "Indiana Jones and the Kingdom of the Crystal Skull"), who plays an intriguingly complex hitman torn between doing his job and doing the right thing. ^ Corliss, Richard (31 January 2010). "Avatar Pushes Mel Gibson Off the Edge". Time. ^ "Edge of Darkness DVD::Standard Edition". WBshop.com. Warner Home Video. Retrieved 21 May 2011.